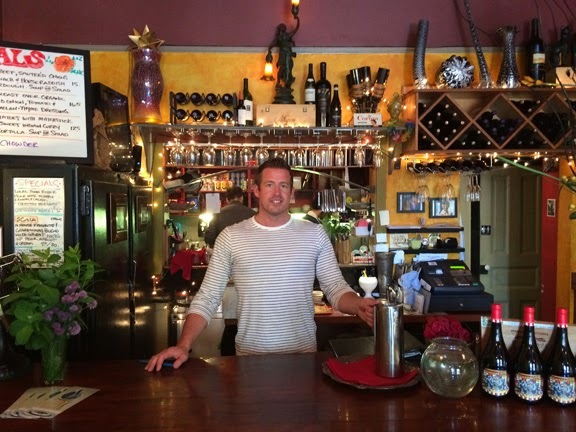 Nicholas Yates, experienced restauranteur and owner of the Fountain Cafe in Port Townsend, welcomes you and your party to experience fine food in a quiet cafe. 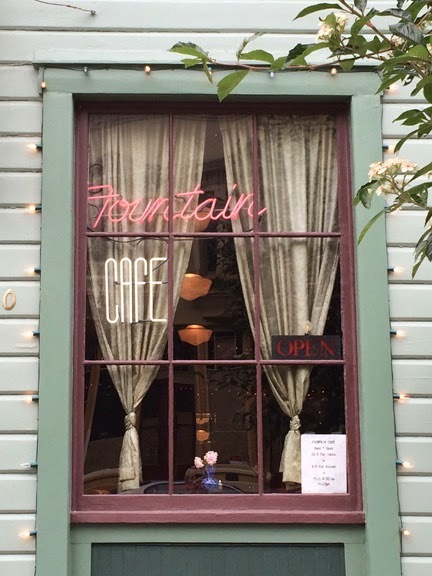 Fountain Cafe is located on Washington Street in an entertaining neighborhood surrounding the Haller Statue and Fountain at the base of the Taylor Street stairs one block from Water Street. The Rose Theatre is just around the corner on Tyler Street. 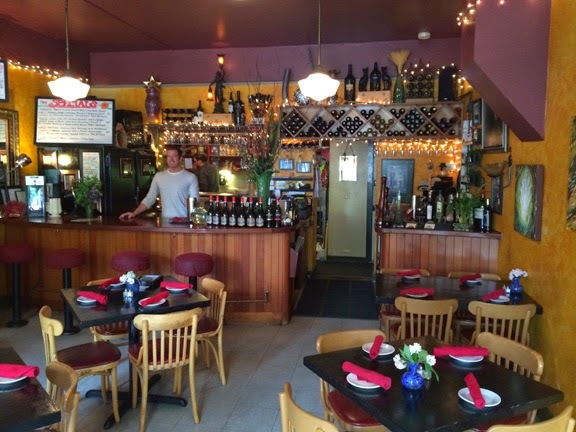 Nearby are an antique mall, the Wandering Wardrobe clothing store, bookstore, Bergstrom's vintage autos and an eclectic selection of other restaurants. 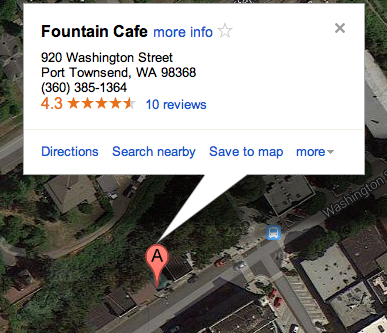 Fountain Cafe is located in the Mary Webster historical building at 920 Washington Street, just a few steps up from Haller Fountain and a short walk from Water Street. Mary Webster building is dated 1889 atop the street facade. Its mint green color is distinctive among the nearby buildings. Its front door is recessed in a small alcove above three steps accessed from the slopping sidewalk, which leads down to the nearby Haller Fountain. 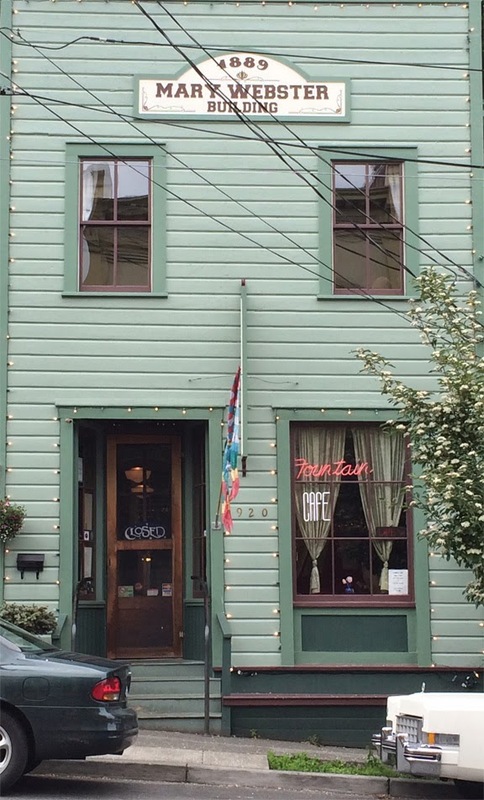 The simple green building is to Port Townsend's Victorian homes as a Quaker gathering place is to a church cathedral. Without the lavish filigree of the uptown homes, the simple lines of the Mary Webster building reflects the simpler life of the downtown architecture. The historic Haller Statue, just down the street from the Fountain Cafe, is a treasured landmark in Port Townsend. The historical work of art has an interesting history. Originally it was designed and sculpted for the Mexican exhibit at the 1893 Chicago Exhibition. After its showing at the Chicago Exhibition it was ordered from a catalog in 1905 and shipped to Port Townsend by Theodore N. Haller. 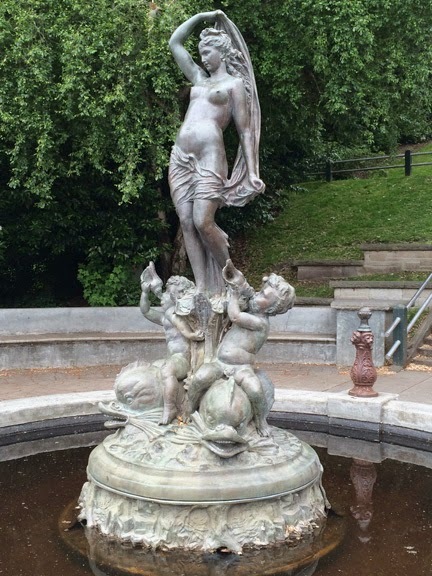 Later the philanthropist donated the "goddess statue" to the city of Port Townsend "in memory of early pioneers." The feminine figure appears au natural and stirred up occasional controversy, particularly among the proper women in the uptown homes above the Haller fountain. Likewise the two cherubs riding dolphins at the goddess's feet seem to have lost their swimming suits. The parklike setting surrounding the fountain is conducive to quiet contemplation, a casual picnic or a bench from which to watch the passersby.